TAOS, NEW MEXICO — Taos, New Mexico is well known as a place steeped in history, legend and lore, but longtime residents also know it as a haven for the paranormal … ghosts … spirits … things that go bump in the night. As a longtime resident herself, M. Elwell Romancito has heard such stories and became intrigued by the way these tales are entwined with the turbulent history, and with the immensely colorful characters of Taos. At first curious and then deeply fascinated, she delved into the origin of these stories and eventually shared them by way of her Ghosts of Taos Walking Tours. Now, for the first time, these stories have found their way into a new self-published book that has just been released. 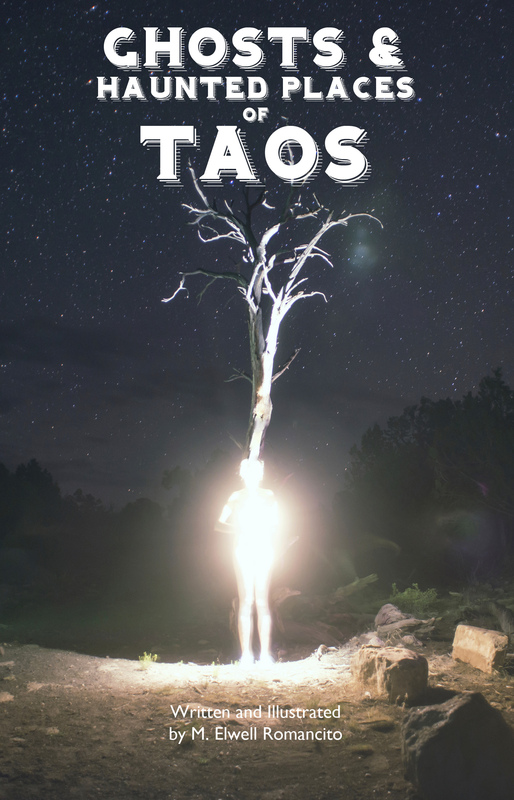 Within the pages of “Ghosts and Haunted Places of Taos” — now available through print-on-demand publishers at Lulu.com and as an eBook available through iTunes, Kindle and other standard eBook distributions – readers will have an opportunity to take a walk through Paranormal Taos. Romancito outlines points in history and accounts for the many ghostly legends and stories Taoseños are known to tell each other by firelight surrounded by flickering shadows on adobe walls. Like the incessant knocking of a disembodied spirit, “Ghosts and Haunted Places of Taos” was a book that cried out to be written. Romancito said it was the blank space missing from the bookshelf chronicling the literary legacy of Taos. She has researched the book with plenty of local lore, personal interviews and oft-retold stories, which she loves to regale those who take her Walking Tours through paranormal Taos. But don’t expect this to be a retelling of what is expressed on these tours. In a sense, she’s merely scratching the surface of a deeply rich resource. “This volume is really centered around the Historic District and the places we visit on the tour. However, that is no indication of how many stories there are out there. We have so many stories and I am eager to hear them all,” Romancito said. “Ghosts and Haunted Places of Taos” is also illustrated by the author, who has collected many historic images throughout the years. She said she wanted the book to be entirely hers, so she rendered many of these historical images in a graphic, pen and ink style. ABOUT M. ELWELL ROMANCITO: A resident of Taos since 1986, Romancito has written and edited for several publications in the Taos area, including a long-standing relationship as an editor, writer or columnist with The Taos News, The Taos Historical Society, Taos Magazine, Taos Experience, Art Talk, Southwest Art and more. Romancito is a member of New Mexico Research and Investigation of the Paranormal, and has conducted several investigations in Taos since 2011.